One of the most meaningful times in my childhood was when my mom would read to me. We would visit the library for story time and I would check out new books every week. Both my parents placed great importance on books and reading and it was easy for me to convince them to buy me a new book when we went shopping. So it was no surprise that on one trip to Costco my mom relented to my pleas and bought me a special edition of The Wizard of Oz. This book was incredible. 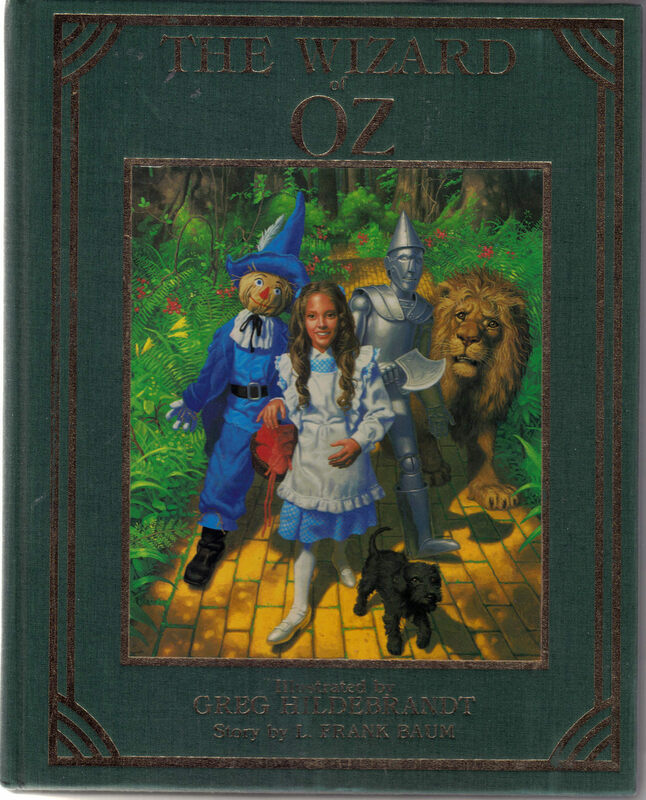 It had a green fabric hard cover with a full color illustration of Dorothy and her friends in the center. On our drive home, I ran my fingers up and down the smooth gold-rimmed pages and fidgeted with green ribbon bookmark that was sewn into the spine. I flipped through the pages to look at the lush and realistic illustrations. Pictures of Scarecrow, with his tall pointy blue hat, were my favorite. I was very excited for my mom to start reading me the book. During the next few days, Mom and I spent time reading the book. Introduced to the story of Oz through the movie, I was surprised to hear all the differences between the book and the screenplay. I enjoyed some of the new characters and adventures. We were about halfway through the book, when Mom turned the page and found a section of blank pages. There was no text! Part of the story was missing! One page ended in the middle of the sentence and the book picked up in an entirely different chapter at the end of the blank signature. I was devastated and my beautiful book was ruined and useless. I kept the now stupid copy on my bookshelf for years just so I could review the amazing illustrations. What never wavered was my interest in and love of the pictures in this edition. A few years later, I purchased a paperback of the book so I could finally finish the story. This copy included the original illustrations from the first printing of L. Frank Baum‘s book. My love of the story and the characters was reborn while viewing W. W. Denslow‘s delightful pictures that were sprinkled liberally throughout the pages. I was more interested in these pictures than in Baum’s text. When choosing an edition to reread in preparation for Bushwick Book Club Seattle’s big show at Folklife, my only qualification was that it included Denslow’s work. Even as a crotchety adult, I find these drawings to be enchanting. My favorite illustration in the book is that of the Hammerhead attacking the poor Scarecrow while his Hammerhead friends watch in the background. The picture captures the action of the Hammerhead slamming Scarecrow in the back without using any comic book style lines denoting movement or action. Scarecrow’s expression shows frustration at being knocked to the ground, while the offending Hammerhead is gleeful. Denslow captures the creepiness of the armless Hammerhead gang and the detail in the illustration is well thought. Each of the background Hammerheads look the same, but bear different bow ties and expressions . They are easily identifiable as a species and although not main characters to the picture, Denslow took the time to differentiate them as individuals. Another image that illustrates these same themes is that of the Winged Monkeys capturing the Cowardly Lion. Again, Denslow pays particular attention to individualizing some of the monkeys by differentiating facial features and giving the leader a hat. The picture shows action with additional monkeys flying in from the background and also that of a monkey securing the rope around the Lion’s front paws. I also find it interesting that Dorothy is so small here. With Judy Garland in the iconic role of Dorothy, it is easy to forget that the Dorothy in the book is a young child and not a demurely dressed naïve teenager. After rereading the book this past week, my interest in Denslow was piqued and I decided to do a little research on the man and his work. I read that Denslow was quite a character with a large mustache. Always capturing dramatic flair, Denslow penned a special signature in each illustration. A stylized seahorse is found next to DEN somewhere in almost every picture in Oz and other works. He started his career as a poster artist and also illustrated a number of other stories for children. Married and divorced three times, he made enough money from Wizard of Oz and other projects to buy a small island in Bermuda and crown himself King Denslow I. He worked with L. Frank Baum on two other books before their professional relationship was ruined by an argument over the royalties for the 1902 stage adaptation of Oz. He shared copyright of the original edition with Baum because of the extensive illustrations and money he spent towards the printing costs. His most notable non-Oz work was a collection of nursery rhymes and picture books including Denslow’s Mother Goose. His style in these later works is much the same as seen in Oz. A favorite from these collections is his depiction of Humpty Dumpty after his great fall. Dumpty’s yolk face is full of anguish and his egg white body is splatted on the ground. Another picture deep with details is one that accompanies Old King Cole. The King is relaxed and happy waiting for his bowl and presumably listening to his fiddlers three. (Sidenote: Smoking in a book for kids?! When was the last time that happened?) His manservant looks glad to bring the King his food, so the reader can surmise that Cole is a benevolent ruler. Even his footstool has a happy face. The grand expressions seen here are typical of Denslow’s work. Perhaps because it never really evolved, Denslow’s style unfortunately went out of favor and his popularity waned. By 1910, he had trouble finding work and turned to alcohol. He died of pneumonia in 1915. His gravestone has images of both the Tinman and the Scarecrow and his seahorse signature. I’ll let you in on a little secret, even after this second rereading, I still think the Wizard of Oz movie is better than the book (Shhh! Don’t tell anyone. I know it’s sacrilege to appreciate the movie adaptation more than the book.) Baum’s adventure drags on a little too long for me and I prefer the screenplay. The illustrations Denslow originally penned more than 100 years ago will always be my favorite depiction of these iconic characters trumping even Judy Garland and my misprinted special edition that my mom bought for me back in 1985.